Like all prehistoric counterparts of today’s animals, the prehistoric cats were usually larger, heavier and more robust than today’s felines. Here are the top five largest prehistoric cats. For a comparison, male African Lions sometimes exceed 250 kg (550 lb) in weight. Reported body measurements in males are head-body lengths ranging from 170 to 250 cm (5 ft 7 inches to 8 ft 2 inches), tail lengths of 90–105 cm (2 ft 11 in–3 ft 5 in). Male Siberian (Amur) tigers have a head and body length of between 190–230 cm (75–91 in) and weigh between 180 to 306 kg (397 to 675 lb). Please keep in mind that the list below is still controversial. It is based on the largest known specimens. It can be changed any time with a newly found fossil. Machairodus was a saber-toothed cat that lived during the late Miocene (11-5 million years ago) in Europe, Asia, Africa and North America. According to skeletal and life reconstructions, Machairodus coloradensis was about 1.2 meter (3 feet and 11.25 in) at the shoulder, and about 200 cm (6 feet and 6.74 in) in length. If accurate, this would make M. coloradensis one of the largest felids. It was about a lion-sized cat, but was more robust and had more muscle mass. Machairodus was probably hunting as an ambush predator. Its legs were too short to sustain a long chase, so it most likely was a good jumper, and used its canines to cut open the throat of its prey. Its skull was noticeably narrow compared with the skulls of modern pantherine big cats (A narrower definition of it includes five members of the genus Panthera: tiger, lion, jaguar, leopard, and snow leopard), and the orbits were relatively small. The canines were long, thin and flattened from side to side but broad from front to back like the blade of a knife. Xenosmilus hodsonae (from Greek, xenos, “strange” + smilē, “chisel”) is an extinct member of the Machairodontinae, or saber-toothed cat. 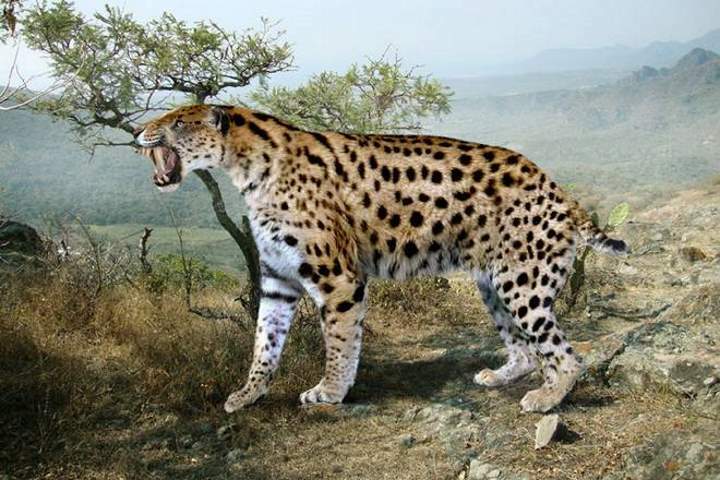 Physically, the cat measured between 1.7–1.8 m (5.6–5.9 ft) long with a highly muscular body and probably weighed around 230–400 kg (510–880 lb). 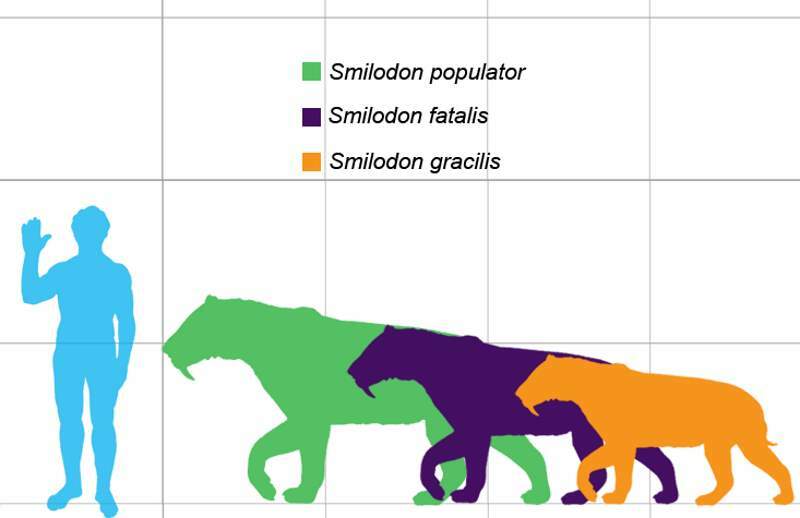 Only Smilodon populator was noticeably larger amongst the saber-toothed cats. It was as big as most adult male lions and tigers, and was much more robust, with shorter, stronger limbs and a very powerful neck. Two fairly intact specimens were found by amateur fossil hunters in 1983 (1981 by some sources) in the Haile limestone mines in Alachua County, Florida. In 1994 the fossils were examined, and it was decided that the cats were of an entirely new genus. 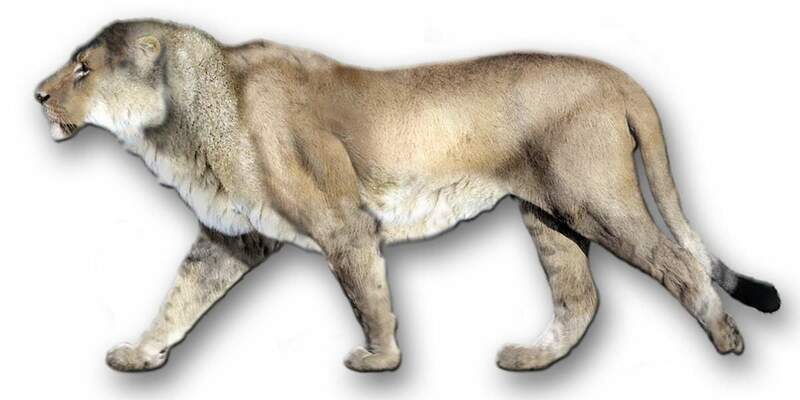 The American lion (Panthera leo atrox or P. atrox) is one of the largest types of cat ever to have existed, slightly larger than the early Middle Pleistocene primitive cave lion, P. leo fossilis and about 25% larger than the modern African lion. The head-body length of the American lion is estimated to have been 1.6–2.5 m (5 ft 3 in–8 ft 2 in) and it would have stood 1.2 m (3.9 ft) at the shoulder. 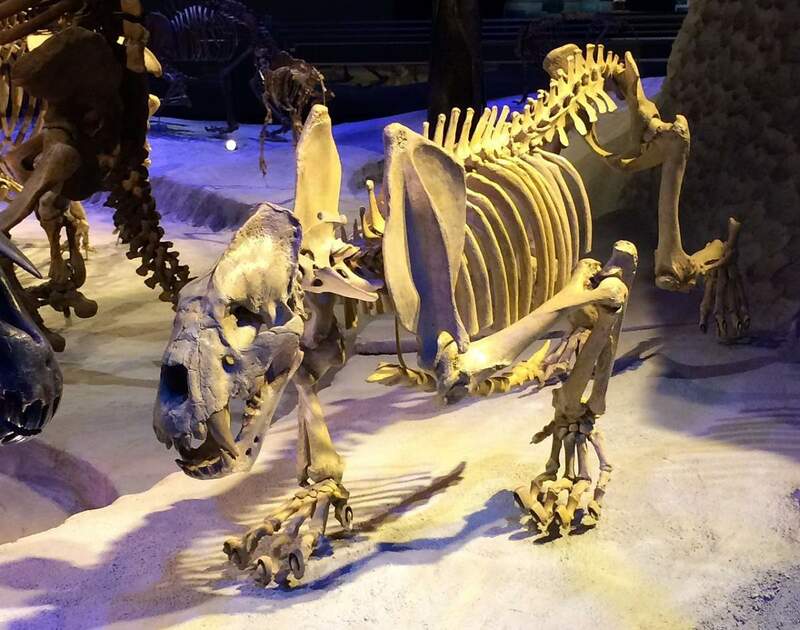 Thus, it was smaller than its contemporary competitor for prey, the giant short-faced bear, which was the largest carnivoran of North America at the time. 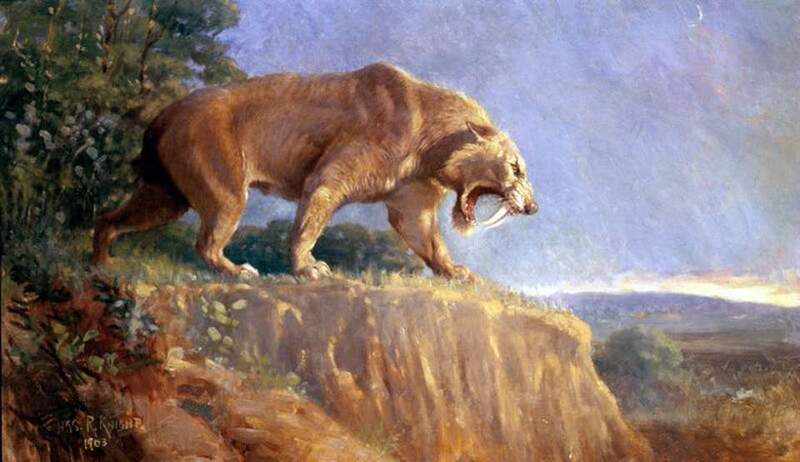 The American lion was not as heavily built as the saber-toothed cat Smilodon populator, which may have weighed up to 400 kg (880 lb). Sorkin (2008) estimated the American lion to weigh roughly 420 kg (930 lb), but a more recent study showed an average weight for males of 256 kg (564 lb) and 351 kg (774 lb) for the largest specimen analyzed. Ngandong tiger size comparison (vs Amur tiger and Bengal tiger). The Ngandong tiger (Panthera tigris soloensis) is an extinct subspecies of tiger which lived in what is now the Sundaland region of Indonesia during the Pleistocene epoch. Fossils of P. t. soloensis have been found primarily in the village of Ngandong, hence the common name. Only seven fossils are known, making the study of the animal difficult. Heltler and Volmer (2007) estimated that a large male could potentially weigh up to 470 kilograms, heavier than the Bengal tiger, one of the largest and most powerful felines of all time. Although Raúl Valvert (2014) later estimated the straight length to be between 172 to 233 centimeters, while the length over the curves was estimated to be 258-350 cm. The minimum weight for females was estimated at 143 kg, although males can weigh up to 368 kg, with an exceptional specimen weighing up to 400 kg. The Ngandong tiger (Panthera tigris soloensis), is an extinct subspecies of tiger which lived in what is now the Sundaland region of Indonesia in the Pleistocene epoch. Heltler and Volmer (2007) estimated that a large male could potentially weigh up to 470 kilograms, heavier than the Bengal tiger, one of the largest and most powerful felines of all time. Although Raúl Valvert (2014) later estimated the straight length to be between 172 to 233 centimeters, while the length over the curves was estimated to be 258-350 cm. The minimum weight for females was estimated at 143 kg, although males can weigh up to 368 kg, with an exceptional specimen weighing up to 400 kg. Perhaps one of the most famous prehistoric mammals, and the best known saber-toothed cat, the Smilodon was more robustly built than any extant cat, with particularly well-developed forelimbs and exceptionally long upper canines. Its jaw had a bigger gape than that of modern cats and its upper canines were slender and fragile, being adapted for precision killing. Smilodon populator from South America is perhaps the largest known felid at 220 to 400 kg (490 to 880 lb) in weight and 120 cm (47 in) in height. The coat pattern of Smilodon is unknown, but it has been artistically restored with plain or spotted patterns. Smilodon was more robustly built than the modern big cats. 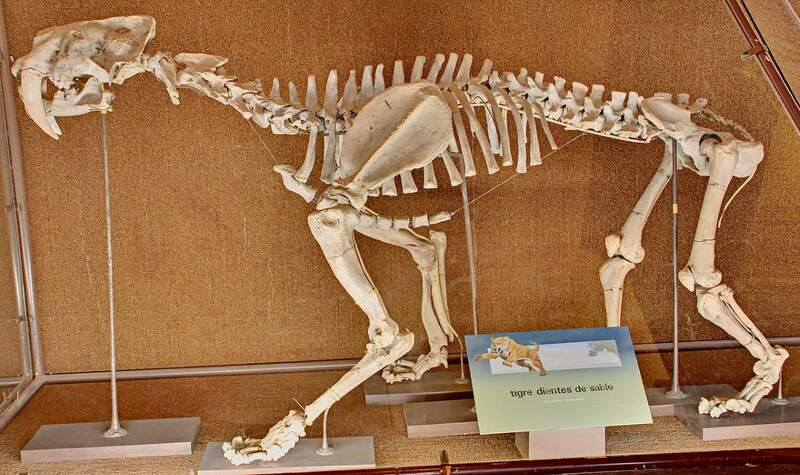 It had a reduced lumbar region, high scapula, short tail, and broad limbs with relatively short feet. Smilodon is most famous for its relatively long canine teeth, which are the longest found in the saber-toothed cats, at about 28 cm (11 in) long in the largest species, S. populator. Smilodon is commonly known as the saber-toothed tiger, but in fact, it is not closely related to the modern tiger (Panthera tigris) or any other living cats. An apex predator, Smilodon primarily hunted large mammals. The liger, the largest of all known extant felines, is a hybrid cross between a male lion and a female tiger. Hercules, the largest non-obese liger who lives at the Myrtle Beach Safari wildlife preserve in South Carolina, is the World’s largest living cat, according to the 2014 Guinness Book of World Records. He weighs 922 pounds (418.2 kg), is 131 inches (332.74 cm) long, and measures 49 inches (124.46 cm) tall at the shoulder. 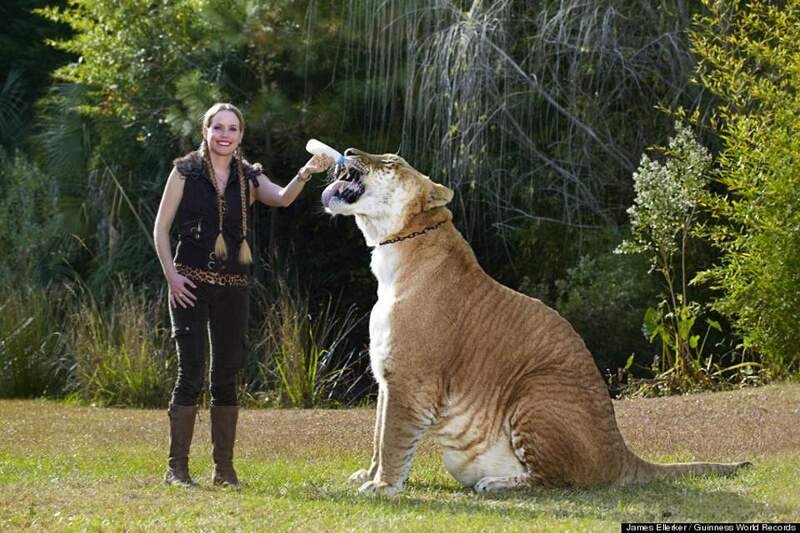 Other big cat hybrids can reach similar sizes; the litigon, a rare hybrid of a male lion and a female tiglon, is roughly the same size as the liger, with a male named Cubanacan (at the Alipore Zoo in India) reaching 363 kg (800 lb). The extreme rarity of these second-generation hybrids may make it difficult to ascertain whether they are larger or smaller, on average, than the liger.